Nothing beats the smell and taste of freshly cooked bread. If you have tasted sandwiches made using homemade sourdough loaves, you’ll agree that they are more delicious than the conventional sandwiches sold in fast food joints. If you love baking goods at home, you may want to experiment with different sourdough recipes. Sourdough can either be made by hand or using a bread machine. How is Sourdough Made and How is it Different? Sourdough is made by fermenting the dough using naturally occurring yeast and lactobacilli. This natural yeast is different from the baker’s yeast that is used to leaven most bread sold at grocery stores. The natural fermentation of the yeast leaves the loaf with a slightly sour taste, and this is why the dough is called “sourdough”. To make sourdough, you will need a preferment, also known as a “starter”. The starter comprises of water, flour, and a mix of lactobacilli and wild yeast (the mixture can be fairly stiff dough or liquid batter). You can top up the starters with flour and water as needed. Some starters can last for years. After adding water and flour, the starter will end up taking about ¼ or 1/3 of the overall weight of the dough. Sourdough is very nutritious, delicious, and easily digestible. Lactic acids neutralize the phytates in the flour, which leaves the minerals and vitamins in the bread easy to digest. If you have a decent recipe, you can make sourdough bread in a bread maker. However, it is best to use a bread maker with sourdough settings. In particular, check that the machine has an adjustable rising timer. Generally, sourdough takes a longer time to rise than bread leavened by commercial yeast. The preferment used will determine the time it will take for the sourdough to rise. This time can be difficult to determine when using a bread machine. Watch the video below to learn how to make sourdough bread in a bread maker. For the best results, you should use a sourdough bread machine mix for your preparation. We recommend the Old World Whole Grain Sourdough Mix. If you are looking for a kit that has everything you need to get started with baking sourdough, get the San Francisco Sourdough Starter Tool Kit. The kit includes a bread thermometer, brush, recipes, and everything else you need to make sourdough. Which is the Best Bread Maker for Sourdough? Most bread machines available on the market today can handle sourdough without any problems. However, it is best to go for bread makers that have sourdough settings. These machines have been specially designed for the rise and kneading requirements of sourdough. Below is an overview of the top rated bread machines for sourdough. The Breville BBM800XL is one of the best bread machines for sourdough. This model is flexible in terms of quantity as it can bake four different bread sizes (1lb., 1.5lb., 2lb., and 2.5lb.). The Breville Custom Loaf machine has an automatic nut and fruit dispenser. The feature will alert you when it’s time to put some extra ingredients in the dough during the kneading process. There is also a collapsible kneading paddle inside the machine that kneads the dough thoroughly and uniformly. After kneading, the paddle collapses before baking starts to prevent a hole from forming at the base of the bread. The Breville sourdough bread machine has a user-friendly LCD screen on which you can track the baking progress of the bread. Other things you can do on the screen include customizing the bake settings (there are up to 13 options), setting the loaf sizes (4 sizes available), and choosing from 3 crust colors. The machine also has a delay timer, which is perfect if you want to set it to bake bread overnight (or during the day) so that you get a fresh loaf of bread at the time you want. 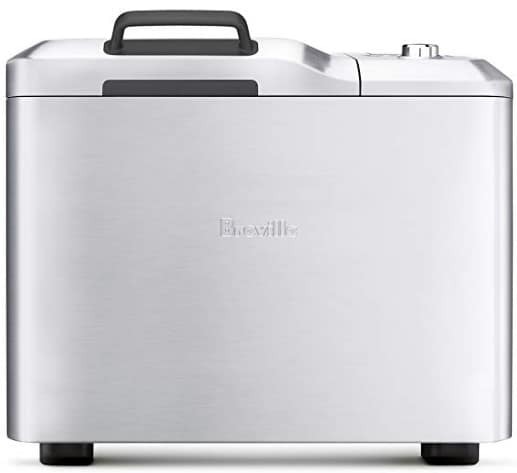 The Breville Custom Loaf Bread Maker is made from sleek and durable stainless steel. At the back, the model has little holding posts for easily wrapping the power cord. The machine’s package also includes 46 recipes that will keep you busy. The Breville is a great sourdough bread machine. The unit is priced decently and its performance is unmatched. However, the machine is a little bit noisy and has a tendency to wander around the counter during the kneading process. To prevent the movement during the kneading process, you can place the machine on a damp cloth on the counter before switching it on. The Zojirushi BB-PAC20 bread machine has a crust heater on the lid that ensures your bread end up with perfectly browned crust every time. 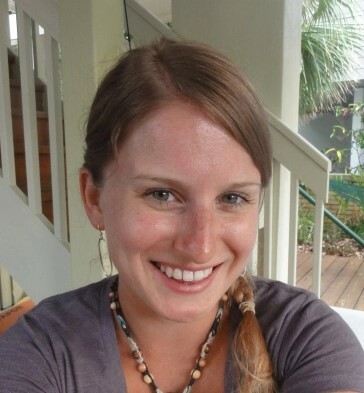 The machine has various bake settings for gluten-free and organic ingredients, and bakes 2lbs. loaves. 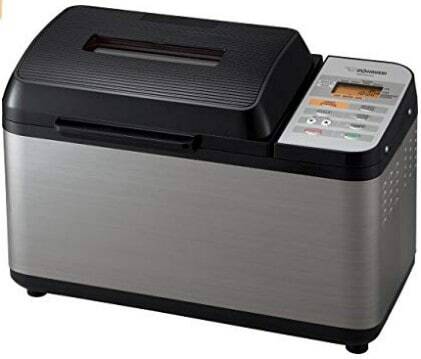 On looks, the Zojirushi bread machine will complement any kitchen thanks to its modern brushed metal exterior look. Coming to performance, the Zojirushi BB-PAC20 does not disappoint. This bread maker has dual kneading blades that thoroughly and evenly knead the dough. There is also a quick bake cycle that you can use to bake fresh bread in just two hours. There are 3 crust options and 10 pre-programmed bake settings on the Zojirushi BB-PAC20. You can watch how the dough is progressing through the machine’s large viewing window. When the loaf has been kneaded and cooked, you can remove and transfer it to your storage area. The machine has a 13-hour delay timer. The Zojirushi bread pan is non-stick. Therefore, you will not struggle to remove the cooked bread nor have to worry about tiresome cleaning. Finally, the Zojirushi bread machine is sold together with an 88-ounce measuring cup, a double-ended measuring spoon, and a manual with dozens of recipes. This model is one of the best bread makers for sourdough. Cuisinart is one of the well-known brands of kitchen appliances. This bread maker is not only effective but also reliable. The machine is made from stainless steel, looks great with other kitchen equipment, and is durable. Moreover, the Cuisinart CBK-200 is quite affordable. 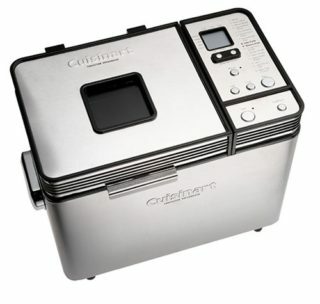 With the Cuisinart bread machine, you can bake 1lb., 1.5lb., and 2lb. loaves. The machine comes with 12 pre-programmed recipe options and three crust settings. Moreover, it has a 13-hour delay timer and you can track the progress of the bread through a large viewing window. The Cuisinart has a removable kneading paddle, removable lid and pan, and is easy to clean. One of the features that make the Cuisinart bread maker stand out from the competition is its power-failure backup and stay-cool handles. Should there be a power blackout when you are baking bread, the power backup will kick in to finish the task. Moreover, the stay-cool handles make it easy and safe for you to handle the machine, even when it is still baking. The Cuisinart is sold with a number of accessories, including a measuring spoon and cup. There is also a booklet with dozens of bread recipes. The main difference between the Cuisinart and other bread machines is that with the former, you have to add the mix-in ingredients you want to be included in the bread at the start of the kneading cycle. With other machines, the mix-in ingredients are added gradually throughout the cycle. 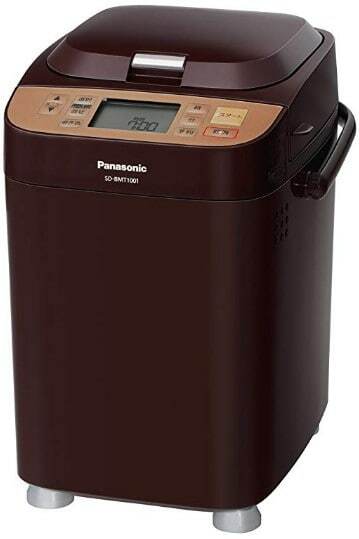 The Panasonic SD-BMT is a versatile bread maker that can not only make sourdough but also red bean bread, steamed bread, brioche, udon, mocha, jam, cake, among others. This is the ultimate multifunctional bread machine on the market. The SD-BMT is a quiet machine that is easy to clean. The device has a nonstick pan that prevents the bread from sticking on. From the list above, the Panasonic SD-BMT comes out top as the best bread machine for sourdough. This machine is versatile and quite affordable. Whether you are looking to make sandwiches for lunch or sliced bread for your morning eggs, this is the best bread maker to use.